FREE screening of the 7-part documentary series, Betrayal: The Autoimmune Disease Solution They’re Not Telling You. This exclusive event starts on November 14th at 6:00pm PST and 9:00 pm EST, US Time. Each episode will air for 24 hours, and then the episode will be taken down to make room for the next, so be sure mark your calendar each night so you don’t miss a single episode. Take the opportunity right now to share this free resource with your friends and family, so they can experience this transformation with you. And to wet your appetite, here’s the scoop on the ground-breaking, life-saving information we’ve captured. Dr O’Bryan is going to take you on an epic journey across the country, and around the world in pursuit to the autoimmune disease solution they’re not telling you. As you travel through the US from coast to coast, and over to England, Spain, Germany and Portugal you’re going to discover the true solutions that you haven’t been told by the medical professionals you may have been consulting. In Betrayal, you’ll travel with Dr O’Bryan as he interviews world leading doctors, scientists, researchers and patients who have reversed their conditions, so you can find implement this life-saving information today. 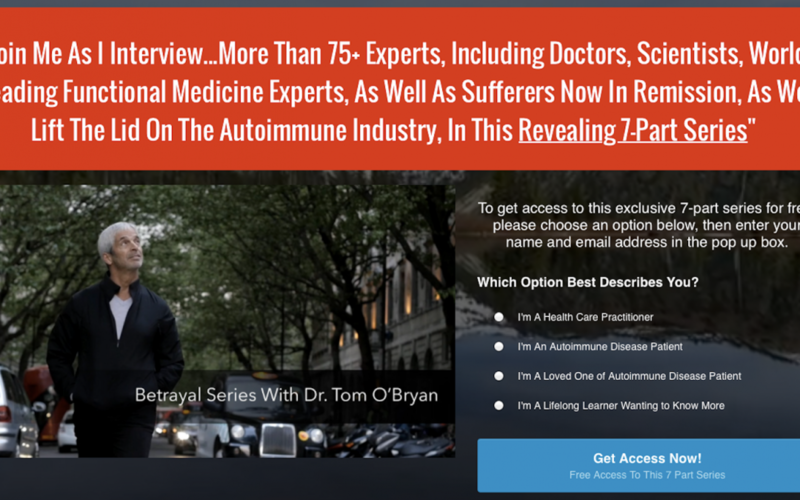 Dr O’Bryan assesses the onslaught of a broad spectrum of life-destroying autoimmune disease, including rheumatoid arthritis, lupus, celiac disease, psoriasis, alzheimer’s, thyroid disease including hashimoto’s and graves’ and reveals the shocking common link between all of these diseases, including the entire autoimmune disease categorization, and then reveals a solution that will leave you speechless. He teams together with renowned film/documentary director and producer, Jonathan Otto who has dedicated his life to ‘telling the truth’ through film, harnessing the power of the personal story, as he has uncovered vital subjects, such as cancer, thyroid disease, as well as humanitarian causes. Dr Tom and Jonathan join hands together to go after a villain that is crippling the lives of over 70 million americans, costing over 100 billion dollars each year nationally, and is ravaging the lives hundreds of millions of people worldwide as it destroys families physically and financially.